Topshop has always been my all-time favorite which is why I am happy to announce that it’s opening another branch here in the Philippines! Woot! Starting tomorrow at 5pm, Topshop will already be available to the public at Robinsons Magnolia. And to celebrate, Topshop prepared quite a lot of promos for you guys! Shop tomorrow at Topshop / Topman and get 20% off on all regular-priced items from 5-9 PM. If you line up early, you can also avail of the Early Bird Promo. The first 50 shoppers to queue in line gets PhP 500 off with a minimum single-receipt purchase of PhP 2,500 on opening day. Topshop also has online promos for you! 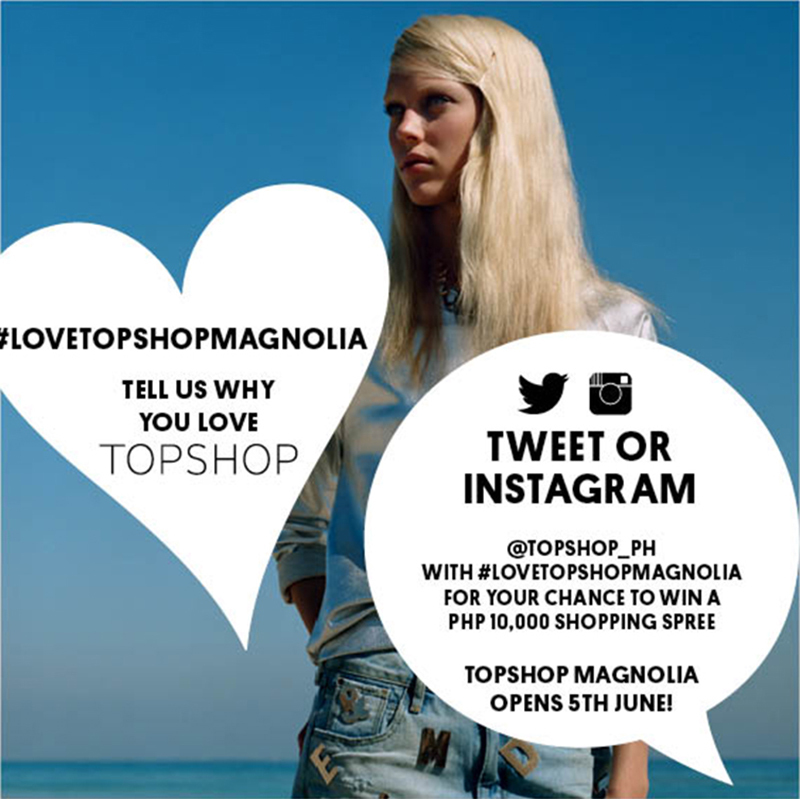 Join their #LoveTopshopMagnolia Twitter/Instagram promo. All you have to do is tweet or Instagram your favorite Topshop piece and tell @Topshop_PH why you love Topshop for a chance to win PhP 10,000 worth of GCs. Don’t forget to tag @Topshop_PH and include the hashtag #LoveTopshopMagnolia. For the men, don’t you worry! Topman also has a contest for you! It’s basically the same as #LoveTopshopMagnolia. 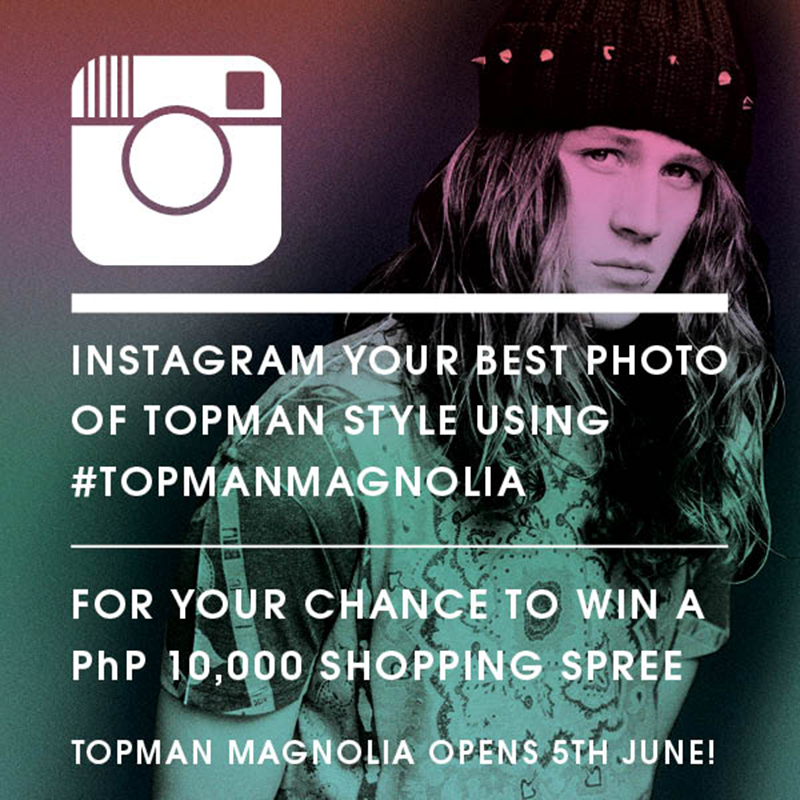 Follow @TopmanPH on Instagram, post a photo of your best Topman style, tag @TopmanPH and include the hashtag #TopmanMagnolia to win PhP 10,000 worth of GCs. Winners for these 2 online promos will be announced tomorrow. Happy shopping, everyone! Hi Camille, what’s your thought on the latest Bangladesh factory collapse? Any insights on how Filipinos should be aware of where and who makes their clothes? It affects all of us in a way. At least now that people are aware, maybe they’d change the working conditions there. Hey! New clothing line based in Phil. Hi Camille! For the topshop piece, can we just select from the website and say that it’s our fave topshop piece or does it have to be something we own??? Hi ms camille! Do we need to post our own photo sporting topshop items or can we just use a photo from the topshop’s website? :) Thanks you!